Gravel pit in 2009. Photo by Urtica Inc. Ecological Monitoring and Consultancy. The unused gravel pit on the corner of Waituna Lagoon Road and Hanson Road had become a spot for rubbish dumping and four wheel driving, while gorse had become well established. In 2009 the Waituna Landcare Group successfully applied for a Department of Conservation Community Conservation grant to restore the area, and work started in January 2010. Back then it contained a variety of different vegetation brought about by disturbance and changes in topography and drainage due to gravel extraction. The original area was probably a peat bog that supported wetland type communities. However, most of the gravel pit area was modified to such an extent that the vegetation and soils did not represent any past ecosystem type. Even so, a survey in 2009 revealed the existence of 47 native plants, providing a good basis from which to start restoration. 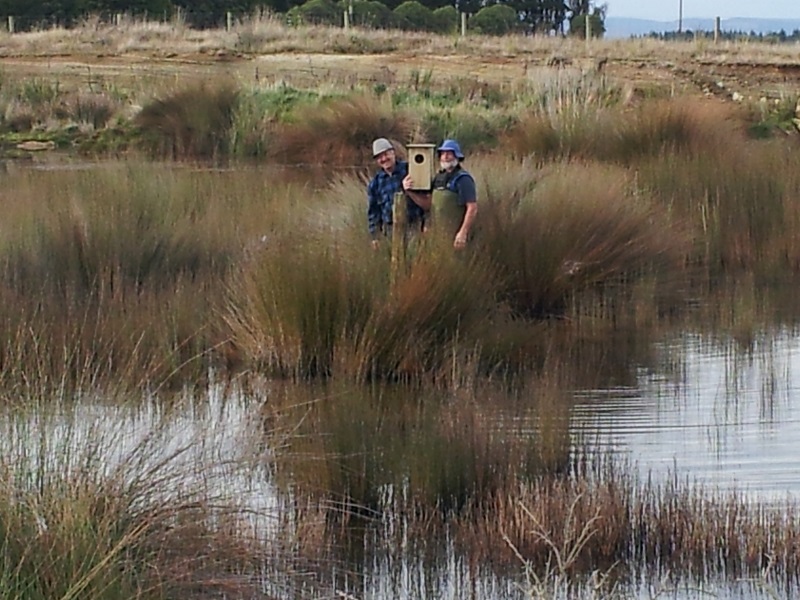 Erecting a grey teal nesting box. Photo by Gay Munro. Fencing, planting and weed control have been the main tasks, however the Landcare Group has also developed a track and most recently installed a lookout over the pond. The lookout has a wetland flora and fauna sign, with more signage planned to be in place in 2018. The gravel pit had a drain that led from the far side of the hole to keep it from filling with water. One of the first things the Landcare Group did was to get a digger to form a barrier to raise the water level. Later a fish pass was formed to encourage the use of the area by eels and kokopu. From the top of the hill where the lookout is sited, you now look down over Polly’s Pond with scattered clumps of the jointed rush (oi oi) which had already established naturally. Nest boxes have been erected to encourage grey teal to use the area. Although they haven’t been seen, scaup have successfully reared young ones on the pond for several years now. Gravel pit in 2015. Photo by Katrina Robertson.